Two bedroom split level house with two bathrooms and a brand new kitchen with stunning views of Mijas Golf Course. Situated in a small family friendly community. Wi-Fi and UK TV included. The house has two bedrooms and two bathrooms on the first floor, with a living room and brand new kitchen on the ground floor. There is a double bed in the main bedroom with an en-suite bathroom. The second bedroom has two single beds. The living room has two three seater settees. There is also a fold up single bed which can be used in the main bedroom. Wi-Fi is provided included in the price. The private patio is accessed from the living room and provides fabulous views of the golf course and mountains. The patio has modern furniture with a glass top table and four chairs, Weber barbecue, sun loungers and side table. The property is an ideal place for a family holiday. The house is situated on a small community of about 40 similar properties. They are mainly holiday homes with a small number of local residents. The people who stay at the houses tend to be holiday makers. The community is fairly quiet and not near any built up areas, situated about 2 miles inland from Fuengirola. You will need a car if you decide to rent the house. The supermarket is a five minute drive, although there is a small corner shop 100 yards from the house which sells essentials like milk and bread. The beach at Fuengirola is less than 10 mins away, but a much better beach at La Cala is only five minutes extra drive. La Cala is a low rise town/village and the beach is often popular with Spanish residents because it’s slightly away from the main tourist beaches. The house has air conditioning, 42" LED Panasonic smart TV, internet TV box that provides BBC, ITV and all UK terrestrial channels, Sky Sports & Sky movies are also included, Blu-Ray/DVD player, washing machine, dish washer and all the usual benefits of a family home. This includes crockery, cutlery, iron, bed linen and towels. You can get access to the two pools on the community. The pool is for all residents and the pool rules, which are sign posted, should be observed. The pool is behind a locked gate and the keys for this and pool toilets are in the house. The house is not near to any “night life” and is not within walking distance for a night out in Fuengirola. There are five Restuarants within walking distance, my favourite being El Golf, which has good food and a nice view of the golf course, if you sit outside. Hotel Tamisa Golf also has an upmarket restaurant with stunning views. There are also two other much cheaper but very friendly restaurants - La Morena and the 19th Hole. They are all very family friendly. 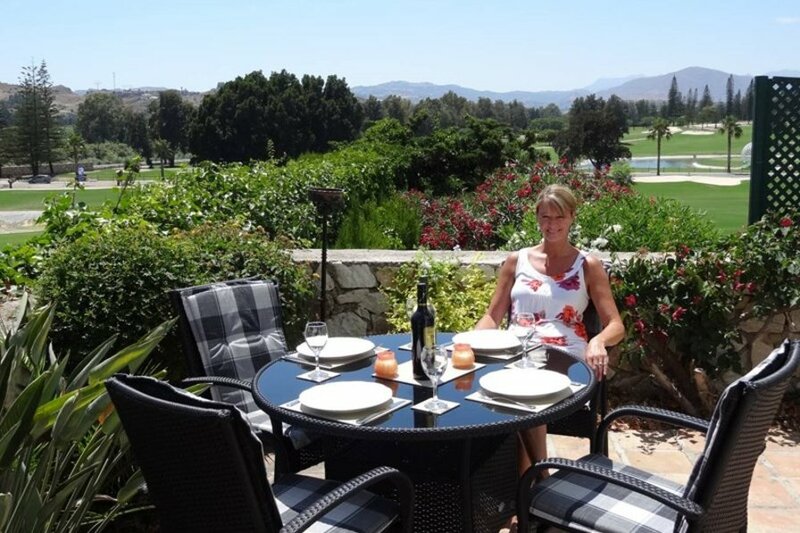 The secluded patio area has stunning views of Mijas Golf Course and the Sierra Morena mountains.